Begin by cooking the brown rice. Bring 2 cups of water to a boil, stir in the brown rice and cover. Simmer on low heat until water is absorbed and rice is cooked through, about 45 minutes. After rice is done, drizzle in toasted sesame seed oil and fluff with a fork. Set aside. In a large sauté pan, heat olive oil over medium high heat. Add the turkey and break into crumbles while stirring often. After turkey is almost cooked through, about 7 minutes, add shallots, lemongrass and garlic. Cook for 5 minutes until aromatics are fragrant and shallots are soft. Add olives and peppers and season with salt and pepper to taste. In a small mixing bowl, whisk the citrus juices with the fish sauce and honey. Add the reserved shallots and cherry pepper. 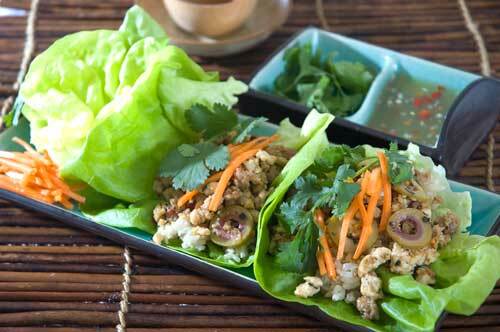 Use the butter lettuce leaves as a “shell” and add a few tablespoons of brown rice on the bottom. Next add the turkey mixture. Top with a few sprigs of cilantro, some mint leaves and shredded carrot. Spoon on some dipping sauce and enjoy! Chef’s Note: Delicious as an appetizer or main course.